Autumn of this year returned me to England. I covered a fair amount of ground, from Windsor to a Somerset village to Bath to London. Overall, this visit was more personal in nature--meaning there was a minimum of research connected to future novels. 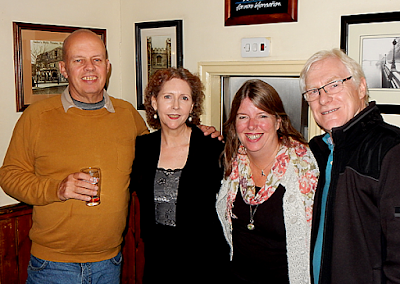 With London Historians--I'm a Founder Member! 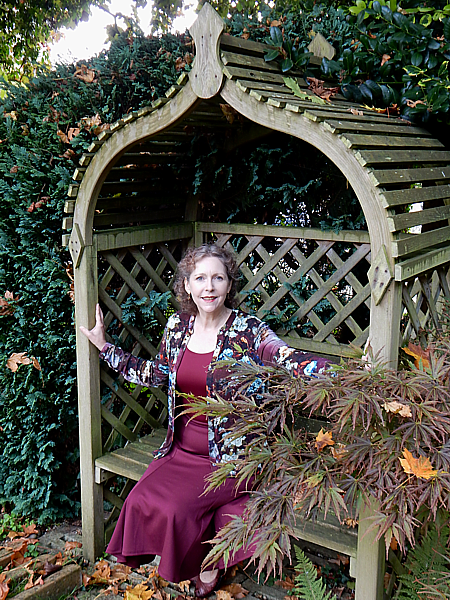 We had an unusually warm autumn in New England, a protracted season for roses and for foliage. 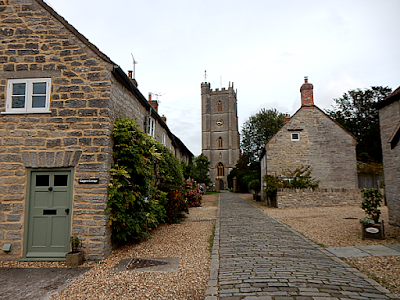 It was a quiet American Thanksgiving--I'm not very good at it, having spent so many of them in England! 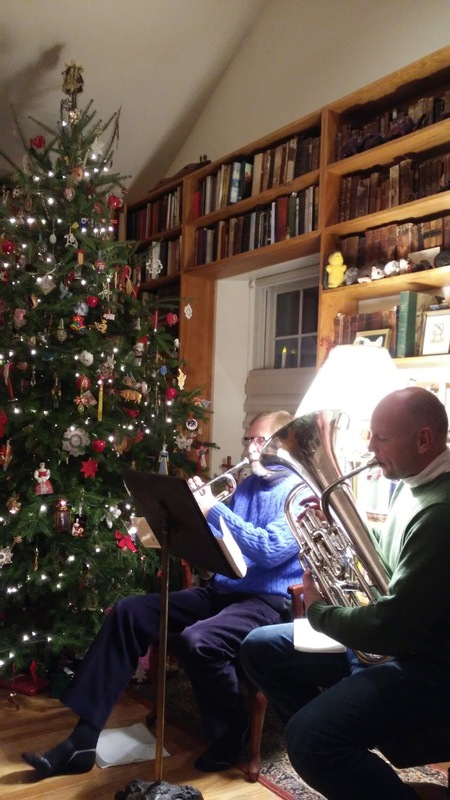 The Christmas festivities began early in December with the cutting of our tree on a mountaintop, and the annual performance of Handel's Messiah. Lots of parties--but of course my favourite is the annual Caroling Party we host for friends and neighbours, with local musicians accompanying us. It snowed on the night, so walking the white streets, singing joyfully, with the flakes falling, was quite magical! The New Year will bring a great deal of travel. But before I begin jetting around, I must finish a manuscript, And then start the next novel! In this exceptional study of the two most notable 17th century diarists, Margaret Willes admirably presents their fascinating friendship, its origins and depth, their mutual interests, many encounters, and most importantly, their shared curiosity. Chapter by chapter she explores with illustrative detail their many connections, not only with one another but also the greatest minds and talents and powers of their era. These two men regularly encountered King Charles II and his successors, Christopher Wren, Robert Hooke—whose passion for scientific inquiry, we learn, led him to smoke cannabis imported from Mauritius. 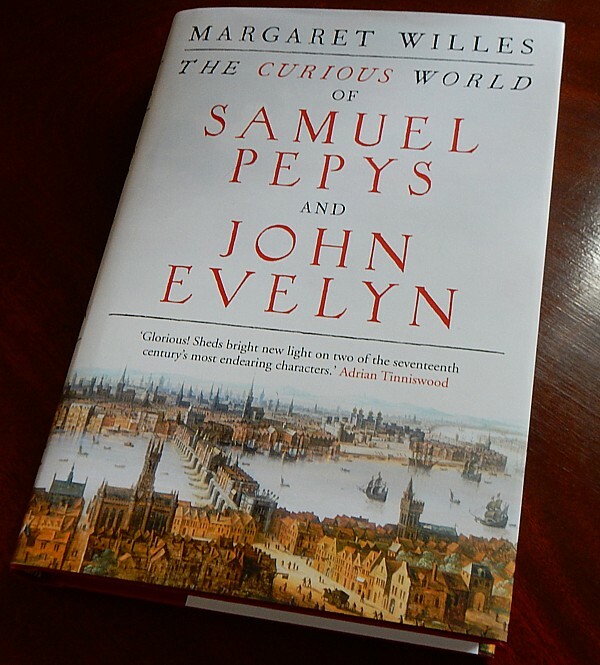 Through their commentary on political events, filtered through personal experience, Pepys and Evelyn have documented a remarkable era populated with agents as well as the victims of change. The men’s diaries are illuminated in a way that clearly delineates the authors' contrasting natures, proclivities, and pursuits. The book’s first section delves into their pre-diary histories and the formative years of scholarship. 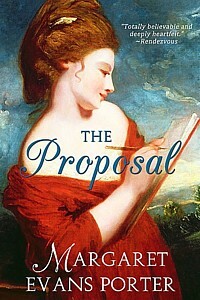 Evelyn, the product of a landed and wealthy family, attended Oxford’s Bailliol and spent the Civil War years in Europe, finding his future wife Mary in an English household in Paris. 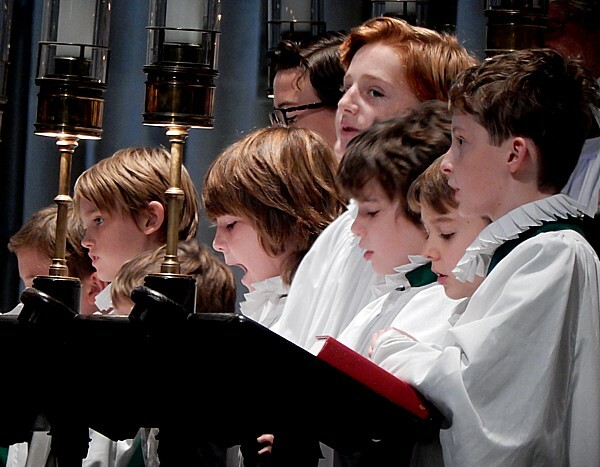 Pepys, a London tailor’s son, was educated at St. Paul’s School in London and matriculated at Magdalene, Cambridge, and afterwards assumed a clerkship from which he rose to a great height. Unlike Evelyn’s bride, Pepys’s brought no money to the marriage. Samuel and Elizabeth did not enjoy the same match of minds enjoyed by John and Mary. With the Restoration, both Evelyn and Pepys commence their diaries in earnest. 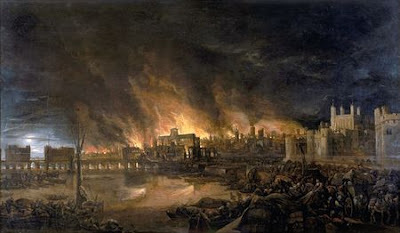 Pepys’s record continued for the next nine years, through plague, fire, and wars, and his various roles in the Navy Office and the Admiralty, reviving it in more succinct form later in life. 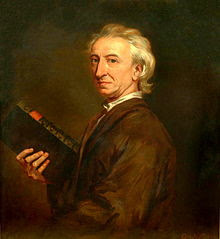 Evelyn’s diary extended to 1706, concluding only shortly before his death. ﻿﻿﻿﻿﻿﻿﻿﻿That the two men respected one another and enjoyed each other’s company is evident. That their tastes and personalities different is equally clear. 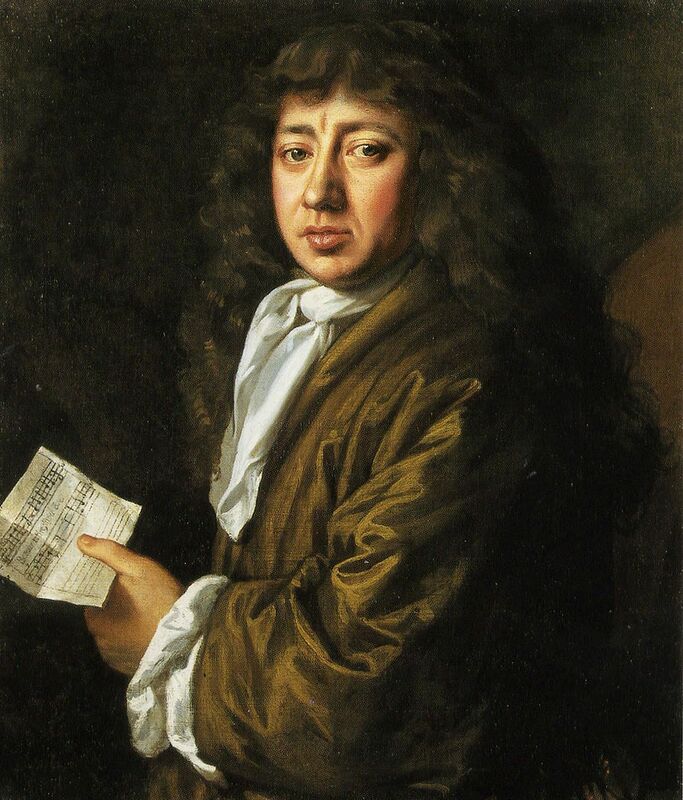 Pepys had a passion for music, ‘the thing in the world that I love most,' playing several instruments, and chased women, especially actresses. Evelyn was no musician, and his admiration of females was more cerebral or spiritual. He was a gardener, a garden writer and designer. Pepys was not, although he commented upon ones he visited with, as Willes points out, more objectivity than the practitioner Evelyn, a more subjective critic. 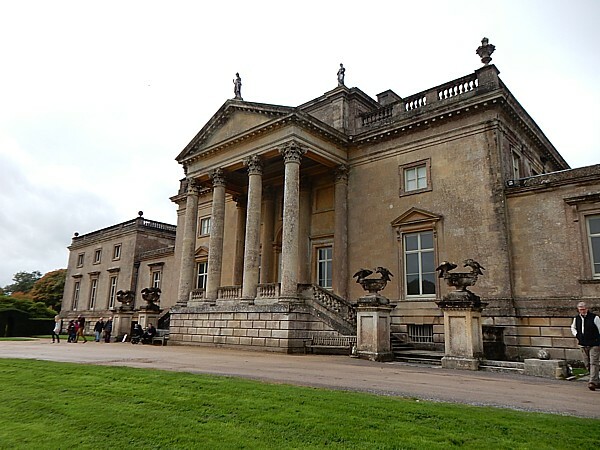 Both were active members of the Royal Society. Despite never presenting a paper, Pepys served as its president, putting his famed managerial skills to good use. Evelyn declined the offer when presented, but continued his close involvement. Their habits were the usual ones common to prominent men of their day—coffee drinking, dining, shopping, collecting, and reading. Their love of books was another strong tie binding them, and Pepys in particular names the London booksellers and printers from whom he acquired his many volumes, now residing at his alma mater. Both demonstrated an improving spirit with regard to the women in their lives. Pepys provided musical instruction for his wife Elizabeth, and Evelyn ensured that his daughters Elizabeth, Mary (a clever writer) and Susana (an artist) were well educated, teaching them Greek and Latin himself. At his death in 1703, Pepys left behind—inadvertently, it seems—an unedited diary, brimming with immediate and lively and highly revealing (i.e. sexually incriminating) incidents. In contrast, the self-aware and cautious Evelyn edited his own diary, which he carefully preserved to inform future generations. 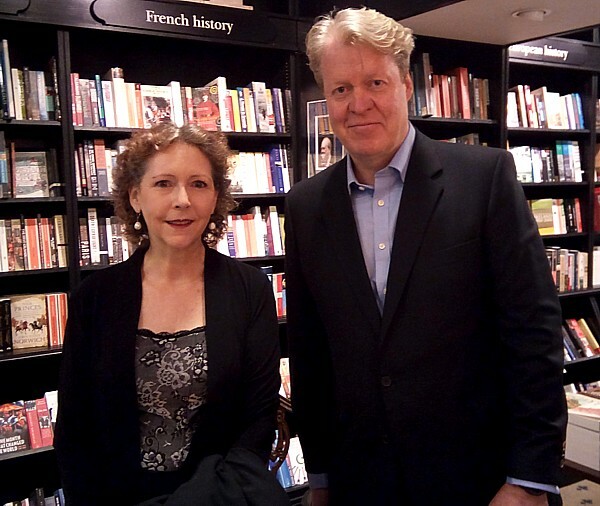 We are fortunate to have both, and in her enlightening and informative history, Margaret Willes adds colour and context to this surprising friendship between two men who together experienced crucial decades in England’s history. 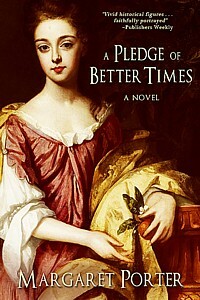 A must-read for those attracted by any and all aspects of the vibrant 17th century. 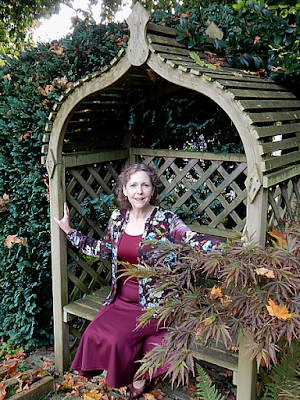 The Historical Novel Society is celebrating its 20th anniversary this year. 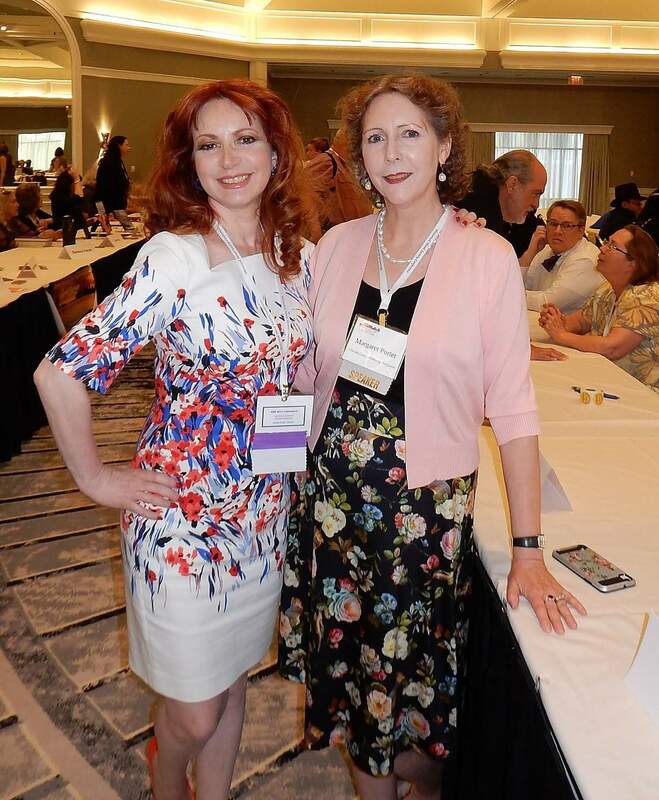 How fitting that the 2017 HNS conference was the largest and the best one yet--according to me, attending for my 4th time, and to those who have attended even more of them. I arrived Wednesday evening. 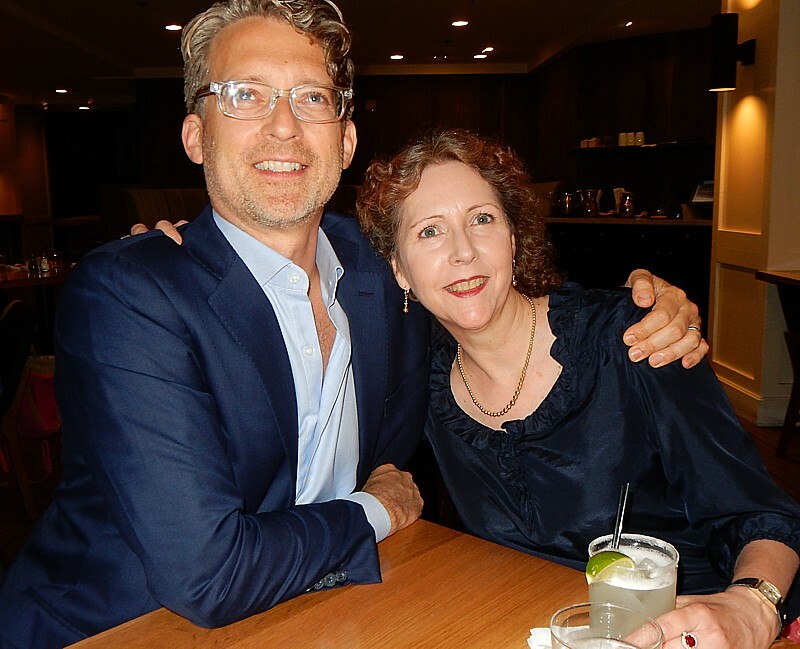 Author talk began early, because my very own first cousin, novelist Justin Evans happened to be in town on non-author business. His novels are A Good and Happy Child , and The White Devil, now in production as a feature film. He lives in Brooklyn. I live in New England. It's mad that we had to cross the entire North American continent to spend time together. 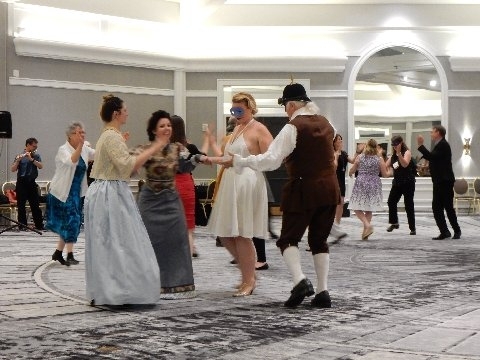 That evening the conference opened with a reception and Costume Contest. 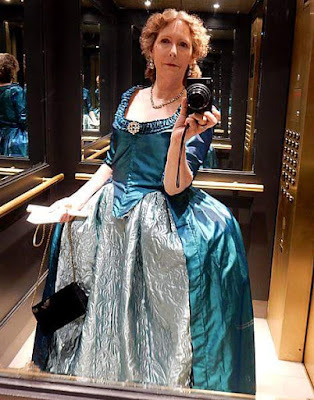 I did not compete in the contest, but I did wear an 18th century ballgown and lots of bling. There were some fantastic garments on display, and it was my first opportunity to see friends and new ones. 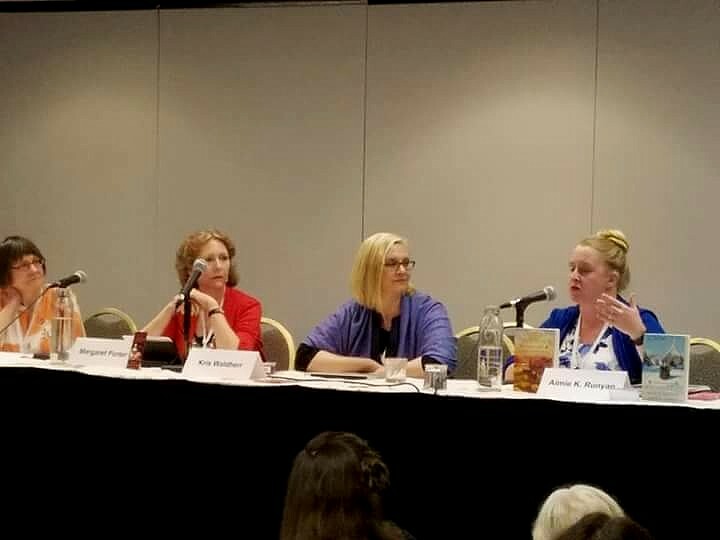 The next day, Friday, I was on the Mixing it Up panel, discussing writing in multiple historical genres--romance, nonfiction articles, biography, etc. 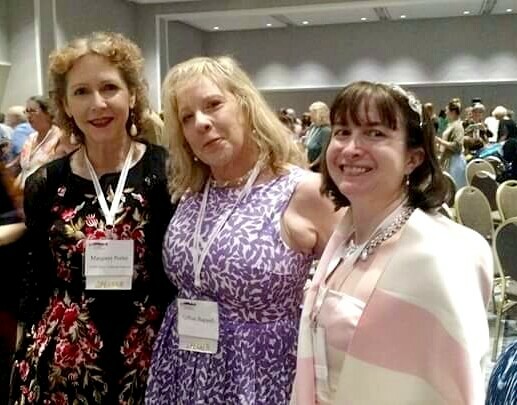 Susan Higginbotham was our moderator, and I was joined by Kris Waldherr and Aimie K. Runyon. A great session, and good questions from our attendees. 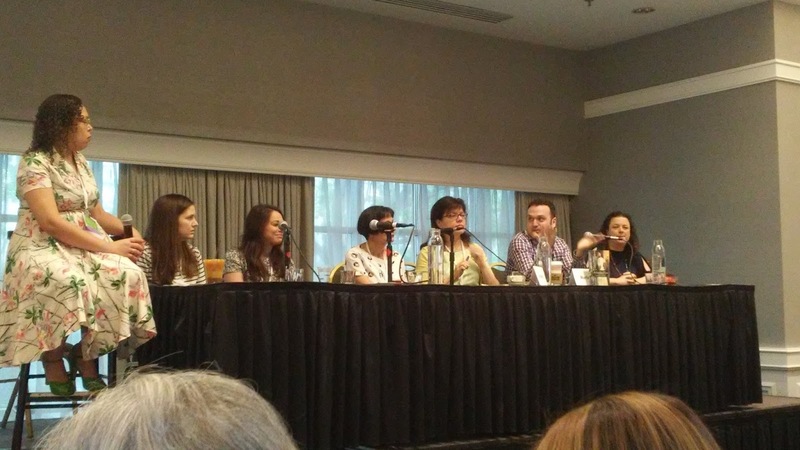 I had the opportunity to see parts of a variety of workshops--Truth in Fiction was excellent and thought-provoking. Isobel Carr's historic fashion presentation, subtitled Clothing Before the Zipper, was a highlight. Alison Stuart covered Cavaliers & Roundheads: The Other Civil War. 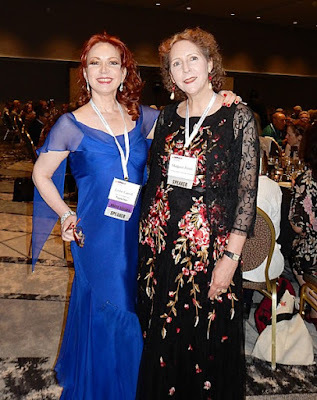 Our luncheon speaker was Geraldine Brooks, Pulitzer Prize winning author of The Secret Chord, Year of Wonders, Caleb's Crossing, and more. So very inspiring. I was also a reader of submitted manuscripts (2 pages only) at a Cold Reads session, with a pair of editors (Ana Michels of Sourcebooks and Lucia Macro, who was one of my editors at HarperCollins) who offered immediate feedback on the material. For me, reminiscent of my times in the recording booth when I narrated audio books and informational films, and did voice-over for radio adverts. We got through quite a lot of pages during that hour-long workshop. The day concluded with Hooch Through History, a drinking through the centuries extravaganza organised, managed, and presented by Isobel Carr. We began our drinking journey through time with medieval mead, followed by port (prompting the immortal line, 'Real women drink red port...naked! '), then an 18th century gin cocktail (with a orangey non-junipery gin), then the dangerous, smoky-green absinthe (we were given an absinthe spoon to keep), and last of all a wet-dry martini from the Mad Men era. As you might imagine, we grew more raucous and giggly as the sampling progressed! Saturday was quite busy from the start, and again I attended a variety of workshops. 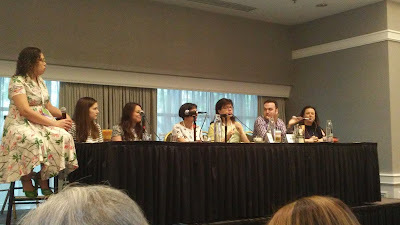 The day began with State of the State of Historical Fiction, a panel of agents and editors. As always, their acquisition tastes are individual, though some of their perceptions of the market meshed. Let's Do the Time Warp: Controlling the Chaos When Writing Different Eras (Stephanie Thornton, Kate Quinn, Heather Webb, C.W. Gortner) was a topic right up my street, having written 12 novels of the 17th, 18th, early 19th centuries--and now completing a 20th century novel before going backwards in time. My friends' insights were very encouraging and illuminating. Our luncheon speaker was David Ebersoff, author of The Danish Girl. Another inspiring speaker who offered wonderful insights. During the public Readers' Festival, I co-hostessed with Gillian Bagwell our themed historical 'Koffee Klatch' on The Merry Monarch to the Four Georges. * * * For my promised list of period films, see below. Late in the afternoon came the Booksigning. 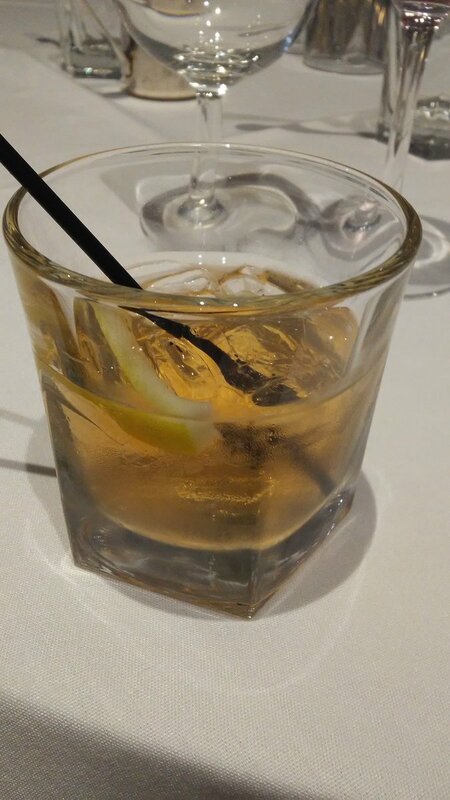 I did lots of table-hopping, visiting friends I hadn't yet seen or continuing conversations with those I had. 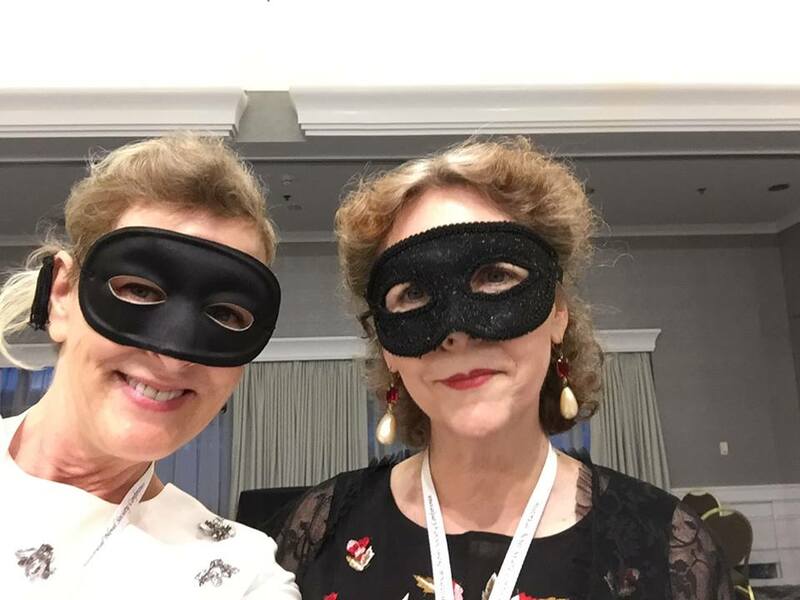 The closing banquet was in the evening--another occasion for dressing up. Australian author Kate Forsyth gave a delightfully entertaining rendition of the legend of Tam Lin--you could have heard a pin drop throughout her presentation. The final event was a Hellfire at HNS Masquerade Ball, with musicians, lessons in English Country Dance, and whist tables. 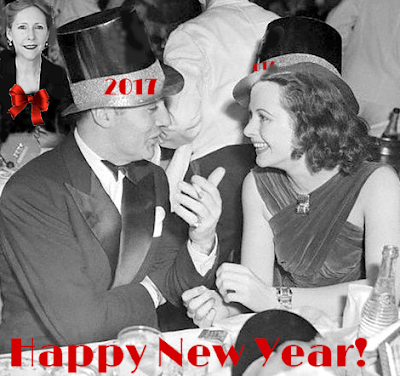 I danced only one dance and continued my socialising, as time was growing short. Parting from my fellow writers was a sweet sorrow--we were all quite eager to return to our projects. 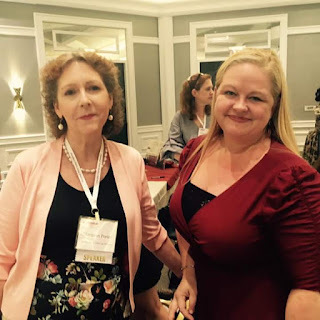 I hope so much to see everyone at HNS in 2019, and perhaps at the UK conference next year. The next morning, Sunday, I boarded my flight back to Boston. I hadn't left the hotel since Thursday. It was a beautiful morning to fly out of Portland, with stunning views of Mount St. Helens and Mount Hood and other mountains. 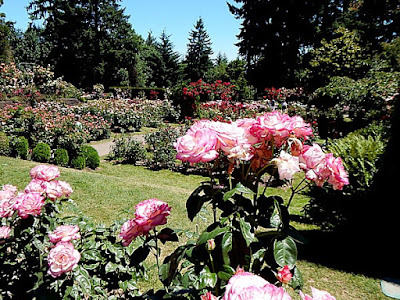 Back home now with husband, dogs, and my own rose gardens, I'm overflowing with knowledge and inspiration, and ready to finish the current manuscript. *** At our 17th/18th Century Koffee Klatch I promised to share my list of period films and television programmes. Not comprehensive at all, and in no particular order--just a batch that were top of mind when I compiled the list or outright faves that I wanted to share. This will be my 4th time attending my favourite writers' gathering, and I've had the pleasure of participating in the UK as well as the US conference. The HNS is an international organization and sponsors major conferences on three continents. This week in, Portland, Oregon, at the Hilton Downtown on SW Sixth Avenue. In September, our Australasia branch holds its conference in Melbourne. Next year, Edinburgh, Scotland. We cover the globe! On Friday, 23 June, I'm a panelist for the session MIXING IT UP: Historical Writing in Multiple Genres, with colleagues Susan Higginbotham, Kris Waldherr, and Aimie K. Runyan. 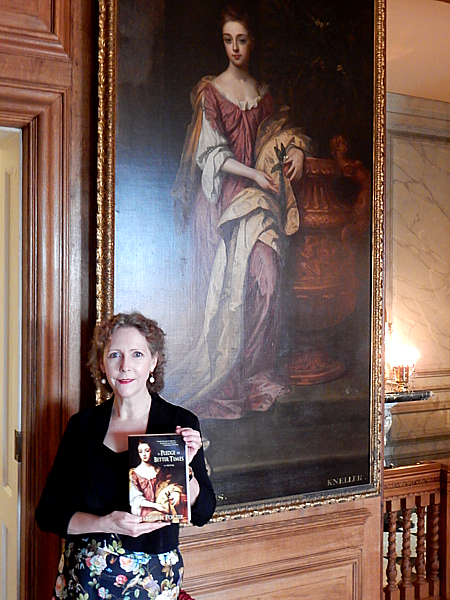 On Saturday, with fellow 17th century novelist Gillian Bagwell, I'm hostessing a Koffee Klatch for the public Readers' Festival titled FROM THE MERRY MONARCH TO THE FOUR GEORGES: 17th and 18th Century London Coffee House Conversation. And, making use of my on-stage experience, I'll be reading aloud introductory pages submitted for immediate comment and critique by editors. The Book Signing, Saturday afternoon from 3.45 to 5.15, will feature 120 authors of historical fiction, and I'll be one of them. Two of my titles will be available, and I'll hand out bookmarks and happily chat with readers and writers. 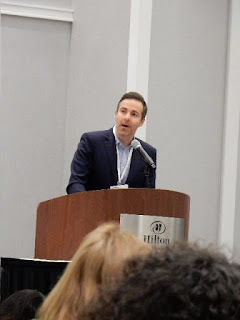 It takes as long to fly to Portland as it does to London, and though I'll be there but a short time, I'm looking forward to the trip--a chance to meet up with seldom-seen writing comrades and editors I've worked with in the past, make new friends, and talk with histfic readers. And as an avid rosarian, I am very eager to visit Portland's International Rose Test Garden! Like so many people around the world, in recent days--weeks, actually--my attention has been glued to the Animal Adventure Park's Giraffe Cam, as April and her mate Oliver await the arrival of their first calf together. An experienced mother, this is her fourth time bearing young. If you suppose putting giraffes on display is a new phenomenon, I can assure you it is not. The earliest artists who rendered the giraffe had not actually seen one and were working from verbal descriptions only--which is why the ossicones initially appear as sharp horns. 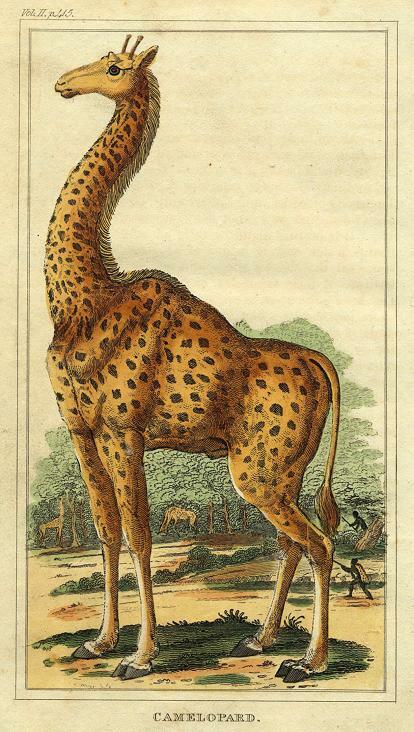 In times past, the animal was called the Camelopard or Camelopardel or Cameleopard from an ancient belief that it was a hybrid of the two! Of course, this is scientifically impossible but the description fits. 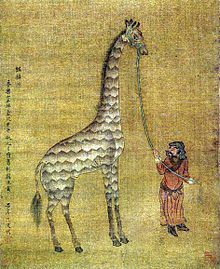 In common with a camel, it has a long neck and long legs and hooves. Like a leopard, it has spotted markings. It is a ruminant (cud-chewing vegetarian, subsisting on plants and leaves) and an ungulate (hoofed mammal). By the 16th century, the cameleopard featured in English heraldry, and from the 17th century it was illustrated in woodcuts. 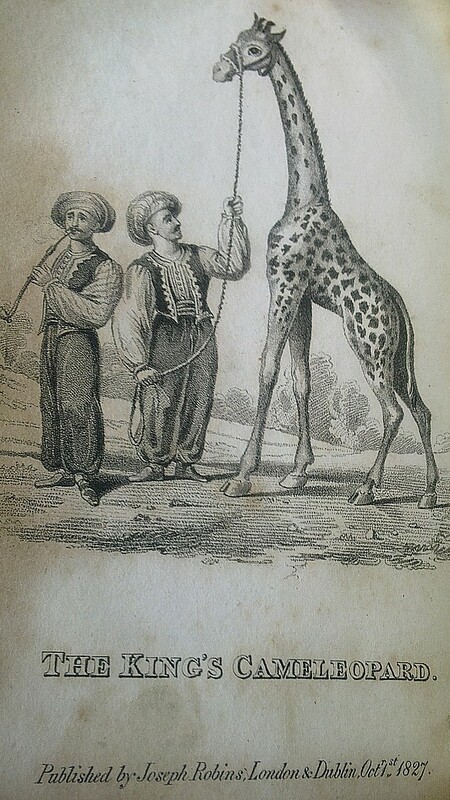 Carl Linnaeus Latinised the common name when designating the giraffe as the Cervus cameleopardis in the mid-18th century. 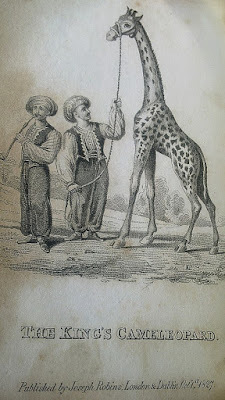 Two decades later the name giraffe was added, from zarāfah, its Arabic name. Multiple species and sub-species originated in Africa and over time they were identified by their geography. Giraffa cameleopardis is the Northern giraffe, Giraffa giraffa is the Southern one, and there are more. 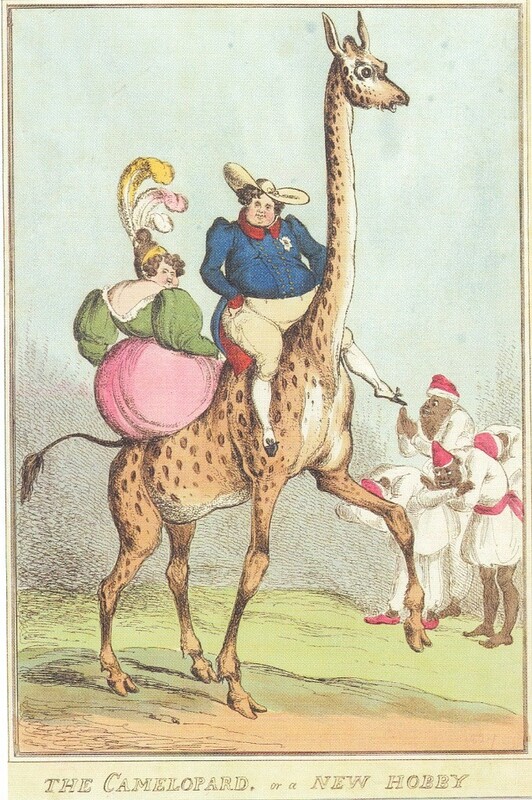 In 1827, in the reign of George IV, the first living giraffe reached England. The satirical printmakers took notice. 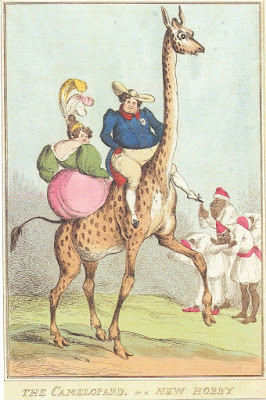 Here, in an imaginary scene, the overweight King and his mistress are riding the giraffe. The poor beast survived the English climate and diet for a mere two years. Most of us are well aware of the tragic depredations to the wild elephant and rhino populations, but the plight of the giraffe is less well known. I'm thankful that the expectant couple, April and Oliver, and the intense publicity centred on their home at Animal Adventure Park have expanded education and information about the plight of their species. 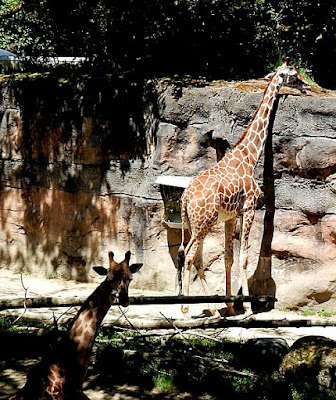 Knowledgeable fans can tell you the pair are reticulated giraffes. This type is sometimes referred to as the Somali giraffe and lives in that country as well as parts of Kenya and Ethiopia. The current status of this subspecies is Vulnerable, placing it in the Threatened category with a native population reduced to 9000 or less. During my husband's travels in West Africa, he was fortunate to see a herd of Kordofan giraffes (Giraffa camelopardalis antiquorum). I stayed in England to carry out novel research and concentrate on family matters, and during his weeks on the subcontinent maintaining telephone contact was challenging to say the least. But I clearly recall how thrilled I was when he described that experience, and on seeing his photographs of wild giraffes. According to the Giraffe Conservation Foundation, this is one of the most threatened subspecies, with only 2000 remaining in the wild. 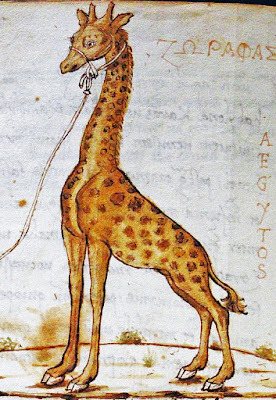 All my life, from my very youngest years, I've loved the stately, graceful giraffe. In grad school, my first film project featured giraffes, and I've been privileged to view them in several of the world's most renowned zoos. Over the years, the care, nutrition, and habitats of these creatures have become ever more sophisticated and scientifically based. Numbers and longevity within wild native herds have drastically declined, due to poaching, predation (primarily by big cats and hyenas), starvation from drought, and other factors. A giraffe is lucky if it lives a dozen years. 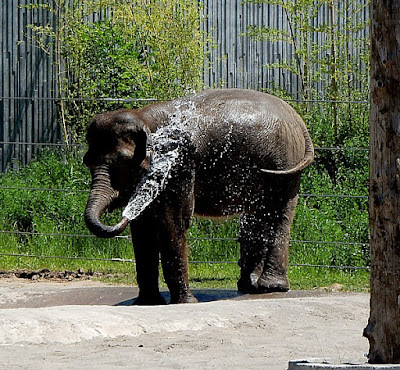 For this reason, captive breeding programs like the one involving April and Oliver become increasingly important--and necessary. Though we might feel concern about so many wild species living in captivity and confinement, their survival now requires it. 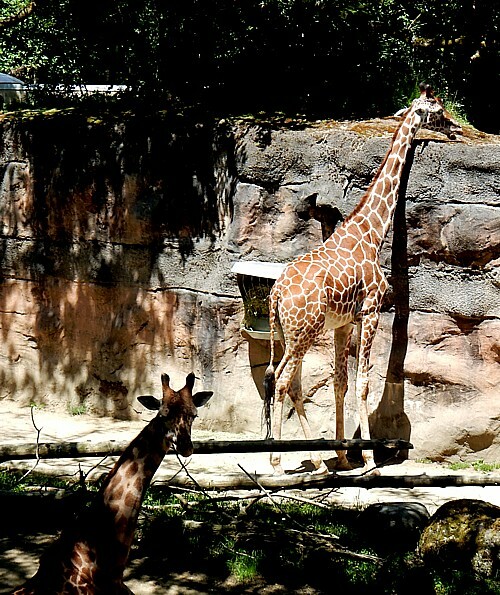 A giraffe raised at a zoo or wildlife park can reach twenty-five years, or more. There are various organization devoted to preserving giraffes, and they provide all kinds of online information and resources. 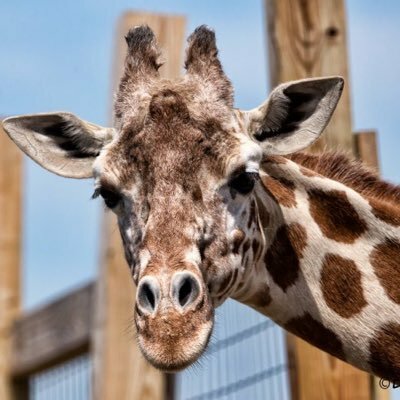 If you wish to contribute to the care of April, her calf-daddy Oliver, and their offspring, visit the official April the Giraffe GoFundMe Page. I'm somewhat familiar with the area where the animal park is located. Although I've not yet visited it, my Giraffe Cam viewing leads me to contemplate a trip to meet the parents, their new arrival, and the many other exotic and domestic animals and wildlife in residence there. A very happy New Year to friends near and far, new and old!